If you’re not a subscriber to ‘The Rowling Library,’ an online magazine sent out as a free pdf to readers around the world, you’re missing out. 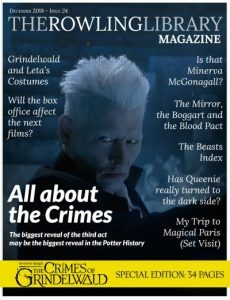 Get thee hence to TheRowlingLibrary.com, download the latest issue — a special devoted to all things Crimes of Grindelwald — and then be sure to scroll around their site. The editors and House-Elves there, for example, have recreated the original JKRowling.com, the site that existed 2002-2012, for fan searching and discoveries. There’s a collector’s guide as well and a very handy (and extensive) list of Rowling’s appearances through the years. The production values of the magazine are first rank and the content is pretty good, too. And I hope I’m not saying that just because they’ve reprinted HogwartsProfessor posts (with permission asked for and received). It’s a serious bunch of fandom researchers and writers from quite literally every continent except Anarctica.